It’s not only the thousands of fans that are missing each day from the racetrack that has Saratoga troubled. That some Saratoga mainstays are missing persons is also a concern. Take Mitch at Large, for example. Horseplayers hitting hard times used to find humor in his vignettes on the track’s video messaging boards and closed circuit television network. Now the three-minute interviews are gone. They weren’t much about horse racing anyway. In fact, they were a hodge-podge of the goings-on that people who need a break from the fine print in the racing forms can relate to. Too bad. Jake Schmidt, the 87-year-old white cap, who watched over Section E, is missing after 15 years. Jake was planning to be up from Satellite Beach, Florida for the meet, until his wife Jane confessed that she wasn’t feeling a drive of 1300 miles would be manageable. “Old ushers never die, they just fade away,” was Jake’s way of saying farewell. Now, who’s going to stand sentry over the Man O’ War Cup on Travers Day? The legendary Richie Bomze has called Saratoga quits, also. In recent years, Bomze has been slowed down by emphysema. Yet, that inconvenient affliction didn’t hold him back from giving all that he could muster to wrest the franchise away from NYRA. Bomze is the former president of the New York Thoroughbred Horseman’s Association, many members of which were supporters of Empire Racing. When ex-Governor Eliot Spitzer announced in favor of the New York Racing Association, Bomze lost the bid, his clubhouse box and his enthusiasm. Bomze’s legacy, however, is destined to be linked to his horse Fourstardave, and, so when Red Giant stood in the winner’s circle for the grade II turf race that honors Fourstardave’s name, it was sad that the big-hearted, loud-talking man, who campaigned the hard-knocking gelding, was absent. Keith O’Brien, the son of Leo O’Brien, Fourstardave’s trainer, presented John Fort of Peachtree Stables with the trophy. 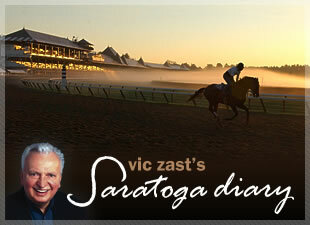 “The Sultan of Saratoga,” as Bomze dubbed Fourstardave, won at least one race in Saratoga each year for eight years. Today, he is one of three horses buried in Claire Court on the Saratoga backstretch. Considering the power of acrimony, some people say that the current name of the Fourstardave Handicap, like Bomze himself, will soon be retired. By the way, fans who watched Big Brown win the Haskell Invitational at Monmouth on television, were asking themselves why the Kentucky Derby and Preakness winner wasn’t reserved for Saratoga. Long ago, reciprocity was required of people, who make the bulk of their money in New York, to support the Jim Dandy and Travers. Ah, well. The passing of time changes everything. Today’s give-away tee-shirt was black, very nice. The 11th race superfecta paid $159,373.00, even nicer.